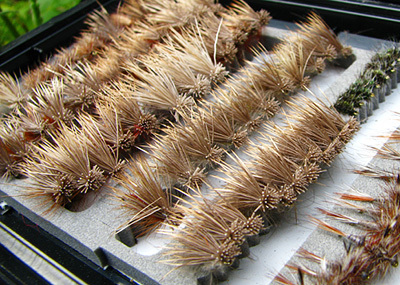 Top: Dries, dries and more dries… one can never have enough when wild trout are rising to the hatch. Middle: Drifting flies at the creek mouths into the deeper stillwaters is producing great fishing. Bottom: Something spectacular… never underestimate the enthusiasm of our WILD rainbow trout! Thanks to Mike Price who nailed this moment in time! Here we are again, our first fishing report of the season. The Chilcotin Plateau has seen a blast of hot weather… the snow pack and river levels are right on schedule along with the hatches and the actively-feeding WILD rainbow trout. First of the insects to show in the streams are mayflies, easily imitated with patterns such as an Adams dry fly or Pheasant Tail nymph, in sizes 12 through 14. 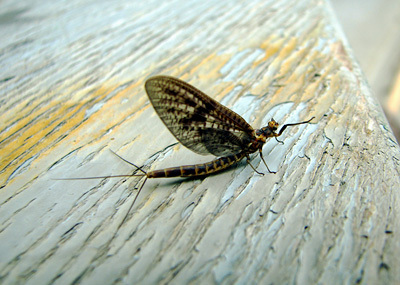 With the warmer weather predicted to continue, caddis flies are not far behind. 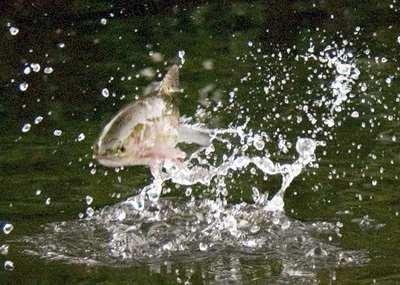 In the lakes, trout are cruising the shoals feeding on insects, such as chironomids, mayflies and dragonfly nymphs, as well as the ‘staples’ such as leeches and sculpins. If the weather continues, we are looking ahead into a great fishing season… the insects are out and the fishing is the best we’ve seen in the last ten years… the fish are silver, healthy and strong fighting. Our guide… Kevin Mayer …one of our regular staffers in prior seasons, has returned for 2009. Taking a break from his new passion… Bikram Yoga, you know, the hot yoga! You will be assured of quality time on the water with a guide who has ‘bin there, done that’, as he knows our waters and the fish. Please be sure to book ahead for our guiding service. And don’t forget about your fishing licence… visit www.fishing.gov.bc.ca to purchase your e-licence online.